Extruded activated carbons (pressed pellets) are mainly made by mixing pulverised anthracite or charcoal with a suitable binder which are extruded at high pressure into a cylindrical shaped form. Sometimes activation catalysts, like potassium hydroxide, are mixed in prior to extrusion to obtain a specific pore structure. 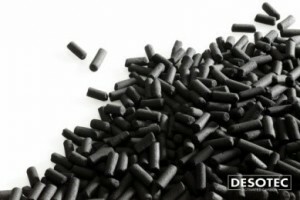 DESOTEC Activated Carbon’s AIRPEL® is used in gas phase applications because of its low pressure drop, high mechanical strength and low dust content. Require more info on extruded activated carbon (EAC)? Be Sure to contact us!